In my previous Faerie Customizations article, I covered most of the unique faeries, and now it`s time to look at the elemental ones. There are six types of elemental faerie: Earth, Air, Fire, Water, Light and Dark. 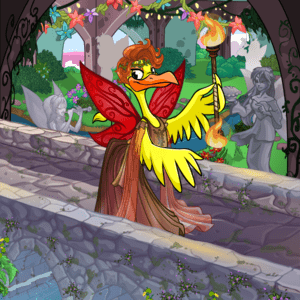 How can you customize your Neopet to resemble a mischievous Fire Faerie or a beautiful Water Faerie? If you`re looking for inspiration for some faerie-related looks, please read on. In this article I have also included famous elemental faeries such as Illusen, Jhudora, Nuria, and others. When creating an Earth Faerie look, your go-to options are green dresses, brunette wigs and backgrounds featuring flowers, forests, gardens and fields. For the wings, there are several green and leaf/plant ones available. 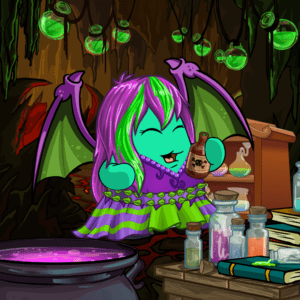 Due to the grass and flowers being part of theTrapped in a Jar item, I feel it`s best suited for Earth and Light faeries. The gazebo and topiaries add to the garden theme. I struggled a bit to find shoes that fit the dress, so I ended up using the matching Delicate Earth Faerie Shoes. Footwear is not strictly speaking necessary for this type of faerie look, as Earth Faeries generally are often depicted barefoot. Illusen lives in a forest glade in Meridell, where she offers quests to Neopians who visit her. She is known for her kindness and is more patient than certain other faeries. During the wars of Meridell, Illusen helped defend the land and offered sanctuary for the peasants. She is also famous for her rivalry with Jhudora the Dark Faerie, though Illusen will not speak of what happened between them. This customization makes use of the Illusen-themed wearables available, and has added detail to complete this iconic faeries look, such as the necklace, gloves and belt. I`d say the contacts and the bow are expendable from this customization, particularly the bow, as four-legged Neopets can`t hold it and it just sits on the ground next to them. You can replace the contacts with the Earth Faerie Eye Shadow, as they cannot be worn at the same time. The Glade Tree House is Illusen`s home, and the mushroom arch creates a nice frame, sort of like an entrance to her glade. Autumn Woodland Short Staff can be used until a proper Illusens Staff is released. Ilere is a mysterious and reclusive Earth Faerie who lives deep in the Haunted Woods. In the Tale of Woe plot, Ilere took young Sophie in and offered her the equipment she needed to become a witch. This is your typical, standard look for Ilere. The glowing eyes and bright markings add magic and mystery to the customization. If you don`t own the Deadly Beauty Dress, try Black Rose Dress or Warriors Victory Dress. 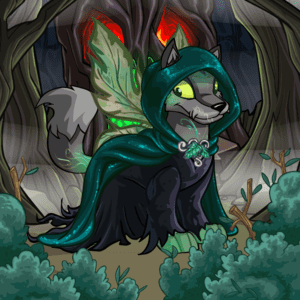 This was intended as a new spin on the classical Earth Faerie look, but it can also double as an alternative look for Ilere, as the green wig and dark dress suit her nicely. The staff can also be used in an Illusen customization. NOTE: The Cloud Gate Foreground does not show up in the image provided by DTI. 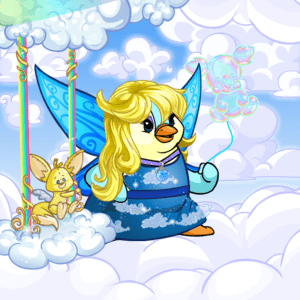 Your standard options for an Air Faerie look is blonde hair, blue clothing, blue wings and a background featuring clouds and sky. There is a handful of cloud-themed backgrounds to choose from, and new Dyeworks versions have added to the selection. I chose the Sparkling Winter Wings both based on the colour, but also for its butterfly-like design. Several Faerie Neopets have insect-like wings, and this wearable echoes that. Although Air Faeries usually have blue eyes, I don`t think adding contacts is needed – I did it in this example to cover up the big, green bug eyes of the Buzz. 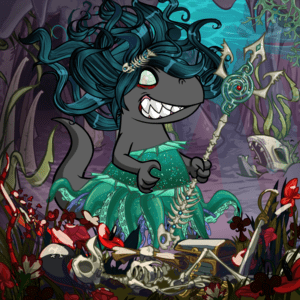 My personal favourite item in this customization is the wig. I like the cloud hairband and the light blue streaks in the blonde locks. An elegant wig fit for a vain Air Faerie. Psellia is one of the protectors of Altador, her constellation is The Dreamer. She is also known for saving Jeran the knight during The Battle For Meridell, when he fell from the Darigan Citadel. Psellia is a kind and peaceful Air Faerie that rarely leaves Faerieland, but she sends messages to the rest of Neopia with her pet Harris. 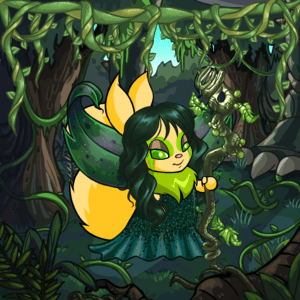 This background can be used with any elemental faerie, but I feel the colour scheme particularly fits and flatters the Dark faeries. Signature colours for these faeries are purple and black, which should be reflected in choices of wig and clothes. 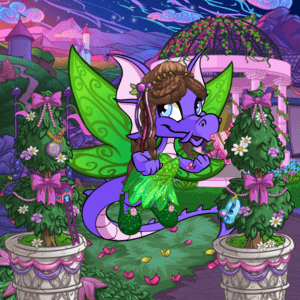 Jhudora is known for offering quests to brave Neopets, but she is also known to inflict terrible punishments onto those who fail to complete them in time... Fyora the Faerie Queen watches Jhudora closely, but has so far been unable to discover her secret plans. Jhudora is also famous for her rivalry with Illusen the Earth Faerie, though no one knows what happened between them to make them enemies. 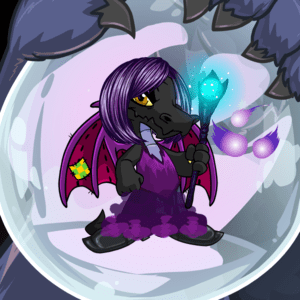 My impression is that most people use the Jhudoras Bluff background when dressing their Neopet up like this famous Dark Faerie, and although it`s a sensible choice, I wanted to explore other options and make use of the lovely Jhudoras Cauldron item. Water Faeries are beautiful and magical, their signature colours are shades of blue. Most underwater scenes fit them perfectly. 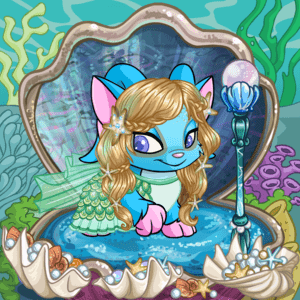 You can add Gormball Splat Foreground or MiniMME9-B: Splashing Puddles to a back background to make it look like your Water Faerie Neopet is sitting/standing in a puddle. In addition to the dresses and skirts used in these examples, try Flowy Scaled Skirt to give your Neopet the illusion of a red mermaid tail. Though traditionally blonde, who is to say that there aren`t Water Faeries with other hair colours out there? 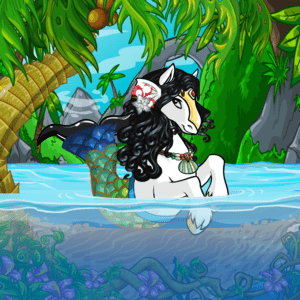 The Dark Tropical Wig gives your Neopet a gorgeous set of black locks, and the pretty flowers fit perfectly in a Mystery Island setting like this one. Floating at the Beach Background is a similar background, but features more open water and sky. Water Faeries don`t have wings, but if you really want to add them anyway, these are my suggestions: Ornate Maractite Wings, Shell Faerie Wings, Water Wings. Who hasn`t dreamed of receiving a quest from the Rainbow Fountin Faerie? 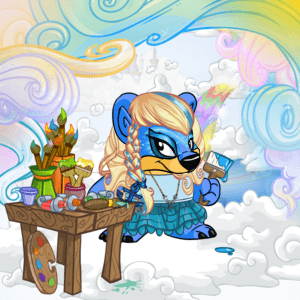 If you`re lucky enough to be given one of her quests, you can bring your Neopet to the Rainbow Fountain in Faerieland and paint them a new colour! Instead of the painters table, try Magical Faerieland Painting or Oversized Paint Brush. Playful Fountain Set causes water to squirt up around your Neopet. The Dyeworks Blue: Summer Orange Root Blonde Wig is also a blonde wig with a hint of blue. These evil, dark Water Faeries appeared in the Curse of Maraqua plot, yet little of their personalities were revealed, and their individual names are not known. There are plushie versions of these faeries, the names of which refer to them as follows: Evil Eldest Drenched Sister, Moderately Evil Middle Drenched Sister and Slightly Less Evil Youngest Drenched Sister. Fire Faeries are known to be mischievous and impatient, their signature colours are those of the flames: Red, orange and yellow. Similarly to the Dark Faeries, they typically have short hair. 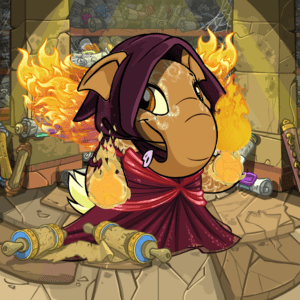 Tyrannian Volcano Lair Background and Volcano Lavafall are good Neopoint options for this look. The idea here is that the bridge functions as a stage for this performing Fire Faerie to show off her tricks. (Just pretend that the faeries in the background haven`t been turned into statues). You can swap the Premium Collectible bridge for Meridellian Festive Tent. This places the Neopet firmly on the grass with a white tent behind her, which also obstructs the view of the poor petrified faeries. Hopefully she won`t set the tent on fire! Nuria is a Fire Faerie from the Lost Desert. In the Lost Desert plot puzzle, a statue of her was featured in a room of the temple of 1,000 Tombs. 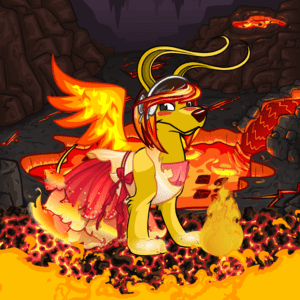 Her wings are literally made of fire, and so she`s always at risk of burning things around her. She`s also known to have strong fire magic. 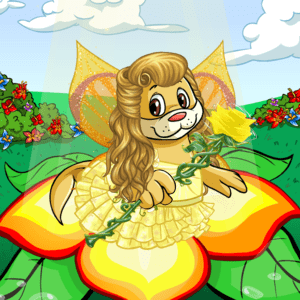 This background, with the beam of sunlight and the big yellow flower, felt quite fitting for a Light faerie. 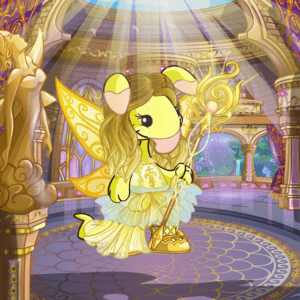 The signature colour for this faerie is yellow, and their hair can be different shades of blonde, golden or white. Their wings are yellow or golden, consider for example Golden Holiday Wings or Queen Buzzer Wings. This beautiful, regal looking background feels particularly fitting for Light and Air faeries, with the bright, open spaces and the sunlight pouring in. The Sun Shower fits perfectly here, and can also be applied to the previous customization. Siyana is also known as The First to Rise, and is one of the twelve founders of Altador. She once saved an entire village of farmers from bandits, by waking them in the night by emitting an intense light. 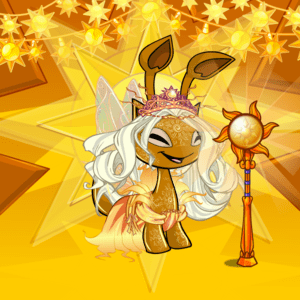 This customization pays tribute to Altador, and of course the very symbol of the Light Faerie: The sun. It`s quite bright and flashy, and that`s the intention. 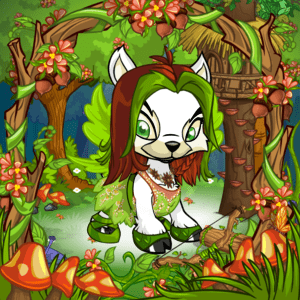 And there you have it, my suggestions to how you can customize your Neopet to look like an elemental faerie! I hope you enjoyed this article, and that in inspired you to try out some new looks. Getting Help On Your Faerie Quest! We've all been there, browsing the site or playing our hundredth game of Pyramids trying to win two in a row, when a generous faerie swoops down and gives us a quest to complete! It's so nice of her to offer, and you really want to complete it, but when you run over to the Shop Wizard to find your item he tells you he can't help you!? What!?!? That's right, when you receive a faerie quest you are not able to search for the item on the Shop Wizard, or even the Super Shop Wizard. You'll have to work a little harder to obtain that item, but it is worth the effort.